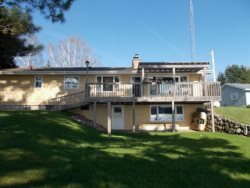 This 2-bedroom cabin features a living room with free-standing gas fireplace and large kitchen/dining area. The main room offers a sofa sleeper for additional sleeping space. The four-season sun room is newly remodeled and the deck presents a great view of Round Lake. Beautiful property!